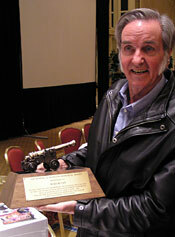 The 2008 Robert A. Heinlein Memorial Award for lifetime achievement was presented to Burt Rutan (photo at left) for his work to create a free spacefaring civilization. As President of Scaled Composites, his continuing innovative accomplishments in sub-orbital launch technology with SpaceShipOne and SpaceShipTwo have provided a great example of space entrepreneurship, may soon provide the spaceflight experience to the public, and has boosted commercial interest in fly-back first stages based on advanced aircraft, one of several promising paths to solving the urgent problem of high launch costs. The 2008 Gerard K. O’Neill Award for Space Settlement Advocacy was presented to Dr. John H. Marburger, III, science advisor to the President and director of the Office of Science and Technology Policy. While he is not an explicit settlement advocate, his public addresses of the last several years focusing on the economics of space development have done more to forward the cause of space settlement than many space settlement advocates. His message, that there are hard economic realities facing the creation of sustainable space transport and commerce, needs to be made a central issue in designing the current space program. 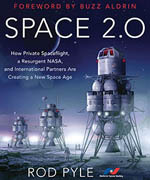 It has helped to demonstrate how to integrate the long-term goal of space settlement into current plans for exploring the solar system, and if implemented, could lead to a sustainable human presence in space. See Dr. Marburger’s pathfinding keynote speeches for the Goddard Memorial Symposium in 2006 and 2008. Space Development: Presented to “The Caballeros”: Col Mike Hornitschek, USAF, Col M. V. “Coyote” Smith, USAF, Lt Col Peter Garretson, USAF, Lt Col Paul E. Damphousse, USMC, with support from Maj Gen James Armor (Ret) of the National Security Space Office. 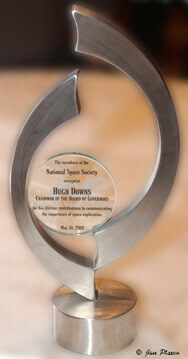 This award was presented in recognition that the Caballeros, working with the National Security Space Office, were instrumental in creating the initial concept and momentum that resulted in the Space Based Solar Power Architecture Study, the SBSPAS symposium, and subsequent media and other events. This process has re-invigorated the concept of Space Solar Power and created a wave of favorable media attention which has not been equaled since the original Solar Power Satellite studies from 1977-1980, and which is still continuing. The Caballeros and the NSS gratefully acknowledge the assistance of many other individuals whose efforts were critical in creating a continuing process that once again is attempting to lead America and the world toward a source of abundant, clean and inexpensive energy for humanity. 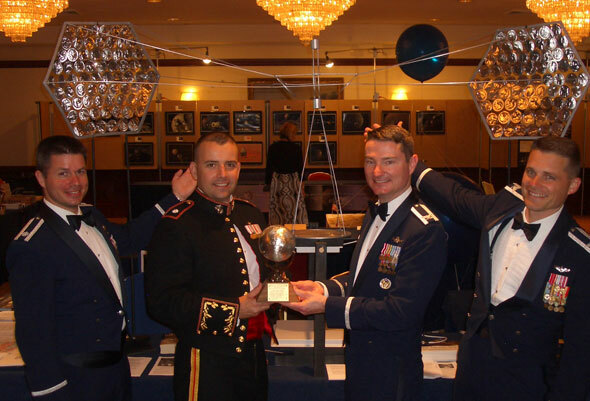 “The Caballeros” receive the Space Pioneer Award for Space Development in 2008 for their work on Space-Based Solar Power (a model of a solar power satellite is behind them). From left to right: Lt Col Peter Garretson, USAF, Lt Col Paul Damphousse, USMC, Col M. V. “Coyote” Smith, USAF, Col Mike Hornitschek, USAF. Education: Presented to Anita Gale (photo at right) for running a space settlement student awards program. As a Houston-based aerospace engineer, Ms. Gale has been tireless in her outreach to the younger generation via her International Space Settlement Design Competition since 1984. Education: Presented to Al Globus for running a space settlement student awards program. Al Globus works for the University of California at Santa Cruz and has been equally diligent in running the joint NASA-NSS Space Settlement Student Design Contest, which he originally established at NASA/Ames in 1994. Al was instrumental in negotiating a Space Act agreement with NASA in which NSS became a co-sponsor of the contest in 2006. Government Service: Presented to Patricia Grace Smith for her unwavering support of the new entrepreneurial space companies during her 13 years as FAA associate administrator at the Office of Commercial Space Transportation. During her tenure, the FAA licensed inland commercial spaceports at Mojave, California and at Burns Flat, Oklahoma, and also licensed the launch and reentry of the X Prize-winning SpaceShipOne in 2004. Also during that time, the FAA published regulations for spaceflight crew and passengers as well as regulations for experimental permits allowing testing of reusable launch vehicles. She, more than anyone else in the federal government, has supported the personal spaceflight industry over the past decade. 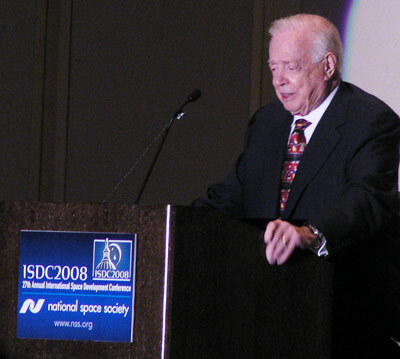 A special Lifetime Achievement Award was presented to Hugh Downs, Chairman of the NSS Board of Governors, for his lifetime contributions to communicating the importance of space exploration. Maharashtra, India. Their winning design was called “Utopia”. “Team Utopia” consisted of Aditya Taunk, Anantpalsingh Chouhan, Aniruddha Shastri, Anirudh Kshemendranath, Anish Kumar, Arjun Rao, Arvind Subodh, Chandrakanth Nambiar, Kiran Lyer, Meher Gudela, Parth Patil, and Utkarsh Sharma. 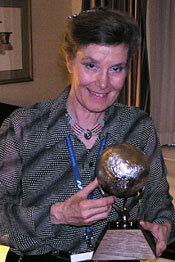 The 2008 Chris Pancratz Space Activist of the Year Award was presented to Rick Zucker. Rick has spent 25 years in private practice as an attorney and was a former Massachussetts Special Assistant Attorney General, as well as founder and president of the Eastern Massachussetts Chapter of NSS. 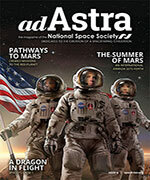 Rick led the effort to negotiate the new Ad Astra contract, chaired both of NSS’ 2008 mass membership visits to Congress, and heads the NSS bequest program.